The Solid Waste Recycling & Composting page is your ultimate resource for thoughtful consumption, recycling, composting and garbage information for the City of Madera. Find your garbage, recycling and composting pickup schedule, a detailed list of what goes in each container, service options and more. The City contracts with Mid Valley Disposal for garbage disposal service. This includes the following service: 96 gallon grey container for trash, green container for green waste, and blue container for recycling. In order to assure service, containers must be placed at the curb or in the alley the night before your day of service. The City of Madera Municipal Code requires that containers must be removed from the street or alley within 12 hours of service and stored on your property. Depending on when a holiday falls during the week, garbage pick-up days for the week would be serviced the following day. Each year the Solid Waste Division holds an all-City Residential Curbside Cleanup. 2019 Annual Residential Curbside Cleanup will take place from March 18th to April 26th! For more information, please see the Official Notice in English / Spanish. The City will be divided into three zones. The maps for each zone can be found below with the corresponding dates for each scheduled pickup. The City of Madera provides all residential customers with a GRAY garbage container, a GREEN yard waste/organics container and a BLUE recycling container. The GRAY waste cart is only for household garbage. Use your GRAY waste cart for household garbage only. Please do not fill it with extra-heavy items such as large quantities of dirt, rocks, concrete, asphalt, lumber or construction debris. Do not fill it with bulky items such as furniture or appliances. Do not put hazardous waste, televisions, hot ashes, or other flammable materials in your container. 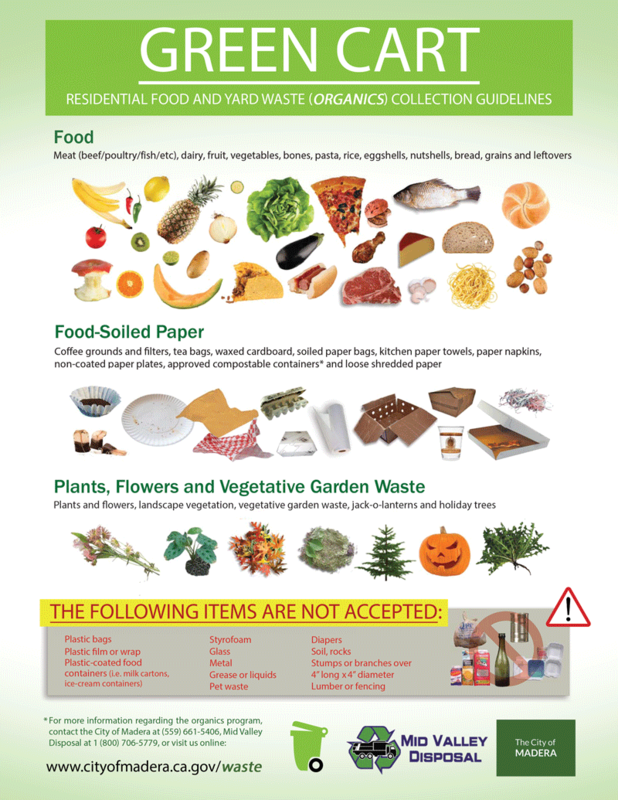 Do not place yard waste in your gray waste cart, place it in your green compost container see section below. Use your GREEN compost cart for yard waste/organics container for all of your yard trimmings, grass and food scraps. Acceptable materials include: grass clippings, prunings, and leaves. The following materials are unacceptable and must be placed in your GRAY waste cart: household garbage, large tree branches, palm fronds and yucca plants. If you continually place unacceptable materials in your green compost cart you may be subject to a fine. Use your BLUE recycling cart for all your recyclable material. Acceptable materials include: all paper products, all cardboard, flattened cereal and dry food boxes, all plastics, all metal, small appliances and glass. DO NOT place diapers, rubber hoses, carpets, clothing, Styrofoam, food, soiled paper, batteries, hazardous waste, televisions, hot ashes or other flammable materials in your BLUE recycling cart. DO NOT overfill your container. If you continually place unacceptable materials in your blue waste cart you may be subject to a fine. Did you know that household products such as cleaning fluids, drain cleaners, oven cleaners, paints and automotive supplies contain hazardous chemicals that can be harmful to you and your family? Products such as these, which are marked "caution", "warning" or "danger", can also pose a threat to the envoirnment. Many common household items contain chemicals that can create environmental hazards if not handled properly. These waste include old paint, TVs, computer monitors, batteries, fluorescent lights, thermometers and thermostats, waste oil and gasoline, and pesticides. Computer monitors and TVs may contain mercury paste and gas along with leaded glass. Deliver your household's old TVs and computer monitors to the Fairmead Landfill, 21739 Road 19, Chowchilla, 559-665-3099. Televisions and computer monitors are now accepted free of charge at the Fairmead Landfill. Mercury is an essential component in fluorescent lamps, and may be found in thermometers and thermostats. If these items are broken or not recycled, they can release harmful levels of mercury into the environment. You can give your old thermostat to your heating contractor to return to their wholesaler for recycling. Remember to buy low-mercury lighting fixtures, and mercury-free thermometers and thermostats. First, if the paint is still usable, you may be able to find a school or non-profit organization that can use the oil paint. If not, take the cover off of the paint can and place it outside to dry out. Once the paint is dry, place it in your gray garbage container. You can also add the old paint to kitty litter so all the liquid is absorbed. Put the kitty litter in a couple of trash bags, then add the paint and dispose with your regular household refuse. Remember to buy latex paint whenever possible. RECYCLE. IT’S GOOD FOR THE BOTTLE. IT’S GOOD FOR THE CAN. IT'S GOOD FOR THE EARTH. Californians bought more than 18.2 billion carbonated and non-carbonated drinks in aluminum, glass, plastic and bi-metal containers last year. More than 10.6 billion of those containers were recycled, saving natural resources, conserving energy and extending the life of our landfills. Imagine what we’ll accomplish if we recycle the other 7.6 billion! What kind of debris can NOT be placed in the Greenwaste Container? Please help the City of Madera keep the greenwaste container clean! NO plastic bags, garbage, household hazardous waste, animal waste, dirt, rocks, tires, flower pots, palm fronds, pampas grass in this container. What Happens if I Contaminate my Greenwaste Container? Your waste collection driver will issue two warnings. If the container is found to be contaminated a third time, the greenwaste container will be removed, ending your greenwaste recycling opportunity. To assure pick-up the container must be placed out by 6:00 a.m. on your scheduled collection day. Where do I Place My Container Out for Collection? Please place your greenwaste container in the same location used for your regular refuse containers. If you container is located on the street, please make sure no vehicles are blocking access to your container. The Recycling Market Development Zone (RMDZ) program combines recycling with economic development to fuel new businesses expand existing ones, create jobs, and divert waste from landfills. This program provides attractive loans, technical assistance and free product marketing to businesses that use materials from the waste stream for their manufacturing. To participate a business must be located in a RMDZ Zone. Madera County Economic Development Commission. Do not over fill your containers. If you would like an additional garbage or yard waste container please call the City Finance Department at 661-5454. The City randomly does audits and tracks additional containers. If any part of your container is broken please call the Solid Waste and Recycling Division at 661-5406. If your GRAY or GREEN container is missing the City can provide you with your serial number to help locate your container. Please call the Solid Waste and Recycling Division at 661-5406 for further information. In order to assure service, containers must be placed at the curb or in the alley the night before your day of service. The garbage truck has automated arms that grab your container to empty it. You must leave three (3) feet of distance between each container and any other object such as telephone poles, mailboxes, and vehicles. The City of Madera Municipal Code requires that containers must be removed from the street or alley within 12 hours of service and stored on your property. The Fairmead Landfill now accepts used mattresses at no cost! Please be advised that certain construction and demolition projects will be required to recycle or reuse at least 65% of the construction and demolition debris generated from projects. The City of Madera’s Municipal Code § 5-3.30 Construction and Demolition Debris Recycling was adopted in an effort to keep these materials out of the landfill as required by AB939 and the California Green Building Code (CALGreen). Oil dumped on land reduces soil productivity. Of the 1.3 billion gallons of used oils generated each year in the United States, less than 60% is recycled. Each year about 40 million gallons of automotive oil is sold to the public. 2.5 quarts of re-refined lubricating oil can be produced from one gallon of used motor oil. Re-refined oils meeting the American Petroleum Institute (API) Standards meet warranty requirements for new automobiles. By using re-refined motor oil, you are closing the recycling loop. More than 50 million filters are sold in California each year. Recycling 1 ton of used oil filters recovers 1,700 pounds of steel and up to 60 gallons of used motor oil. City of Madera residential customers can take advantage of a very easy way to recycle both their used oil and used oil filters. This service is offered the same day as their trash pickup. Let’s say, for example, that your normal pickup day is Monday. On that day, you can leave used oil in a sealed container and your used oil filter in a specially designed “baggie” at your curb, three feet away from your carts. Mid Valley Disposal collection trucks will pick up all used oil and used oil filters as part of their contract with City customers. You can contact Solid Waste staff at the Public Works office by calling (559) 661-5406 in order to replace, at no cost, used oil containers and used oil filter bags. These containers and bags may also be picked up at the Wednesday Swap Meets held at the Madera Fairgrounds, during the Madera Fair in September and any of the planned used oil filter exchange events held in the spring and fall. The City randomly does audits and tracks additional containers. If any part of your container is broken please contact Mid Valley Disposal at 1-800 706-5779.